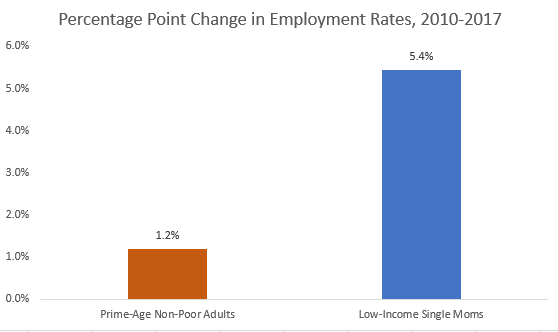 Share the post "New Census data show that low-income people are responding as they always do to tight labor markets…by working!" 2 comments in reply to "New Census data show that low-income people are responding as they always do to tight labor markets…by working!" According to progressives, there are plenty of jobs that need doing, but black people are too lazy. Implicitly, they argue, if American weren’t so racist we would let more Central Americans in to do the jobs that pay less than welfare queens can get by gaming the system. As an old-fashioned liberal, conservatives can’t betray me. It takes a “progressive,” masquarading as a “Democrat” to do that. Who cares about immigrants though? A lot of what you spout has been true since 1800’s. “White” Americans don’t want to do many of the jobs immigrants will do…………in 1885 this was going on. Why do you think there are so many squatters bud? America is the land of technological progress. People want to work with tech. Not pick berries or do housework……..for a living. Nor do I understand why Jared made this post. I mean, Jared, when debt expansion goes, employment will rise. There is no “response” other than that. This is not a investment planned economy. The economy is in trouble Jared. Nonbank financial companies that have powered the borrowing boom are running out of gas. We are seeing this in the auto sector right now as profits have tumbled causing incentives to be withdrawn, lowering future sales. The YrY declines coming by years end will effect employment as YrY declines continue into next year. Goods jobs which Trump cheerleaders are pumping up, will be negative by next spring, YrY. Auto will be struggling. The Quicken Loans bubble is popping much like the mid-00’s banking bubble popped. I doubt this is as Systematic, but you never know and as Bernanke said, much away from the Federal Reserve Systems influence. Debt expansion ends Jared, you need to respect the system.